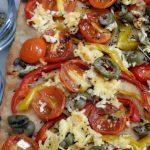 Whole Wheat Focaccia with Peppers, Tomatoes, Olives and Dried Rosemary is a delicious Italian bread that tastes best drizzled with olive oil and oregano and hot coffee and if it is drizzling outside then you are in 7th heaven. Actually, my daughter, I have 2 daughters and one of them is in Bangalore doing a course when she comes home asks for bread. This time she wanted focaccia but since hubby is not keeping good health, my spondylosis was troubling me I kept postponing. Finally, I knew I had to bake the focaccia before she goes back and I used the food processor. Kneading the dough in the food processor is something that I do not enjoy, I love to knead the dough with my hands, I love the feel of the dough under my hands. Therefore, if you are like me you too will know the joy of kneading the dough with your hands. I am participating in Recipe swap and my partner is Vidya Narayan who blogs at Masala chilli. If you are looking for healthy and yet delicious dishes then visit Vidya and enjoy the yummy food. Actually, I have some delicious raitas bookmarked from Vidya’s place, as these are what Hubby can eat to help his ulcers. 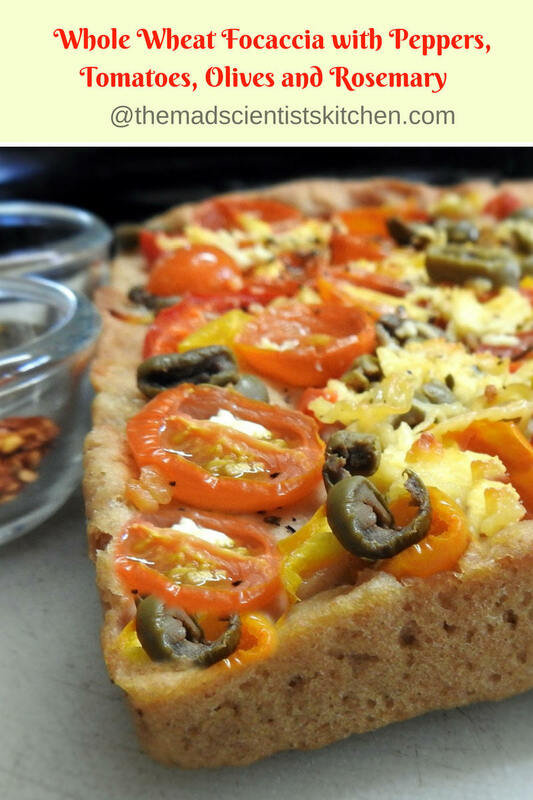 So do watch my place for some delicious and unusual ratias which I plan to make (and hope I remember to click) ; D.
I have used dried rosemary, whole wheat flour, yeast and some butter, red capsicum, yellow capsicum, olives. The toppings you can use as much as you want there are no measures. In case you do not have instant yeast, you can use the same quantity of active yeast. If you are using active yeast, proof it. In a bowl, add the flour, salt, yeast, milk, sugar and knead the dough using lukewarm water a little at a time. Feel the dough while kneading; your hands and eyes are the best judges. You may not need all the water. Transfer the dough on the kitchen platform, add 1 tbsp of butter and knead the dough for roughly 7-10 minutes. In case you are using the food processor then let the processor run after the dough come together for about 3 -4 minutes. Add the butter and let it run for another 4 minutes. The dough should be very soft and elastic to touch after kneading. Grease a big bowl with a few drops of oil. Place the kneaded dough in the greased bowl; turn it over set aside for proofing in a warm place with a clean kitchen towel. Let the dough proof for about 1 hour or until double. Grease an 8 by 7-inch tray and set aside. Gently ease the proved dough on the platform and degas the dough. In simple words, remove the gas in the dough by punching it a few times. Dust the platform with flour and knead for about 5 minutes. Place the dough in the greased tray and spread the dough gently into the corners evenly. With your fingertips, make dimples in the bread dough. Sprinkle the herbs and salt on the dough. Place the vegetables/toppings and slightly press it to the dough so that they do not fall off while slicing/baking. Now place this greased tin for further proving in a warm place preferably for 20-30 minutes. Bake at 200 degrees for 20 – 30 minutes or until golden brown. Once baked, brush a bit of butter on top or drizzle some extra virgin olive oil sprinkle some red chilli flakes if using. Perfectly baked and looks so tempting.. I am so glad you chose this recipe inspite of being super busy with things around. Thank you so much and you have done full justice to both the theme, spirit of cooking and sharing! Love you! Aww! I am blushing here! LOL. Baking with yeast charges my batteries. I am glad you like it. Thanks for all the support dear. Love you too. Focaccia and pull apart rolls are on my to do list from a long time di and your post is tempting me to give this heathy and flavorful whole wheat bread a try very soon ! Thanks, Poonam do try and fall for bread baking it is one amazing experience. 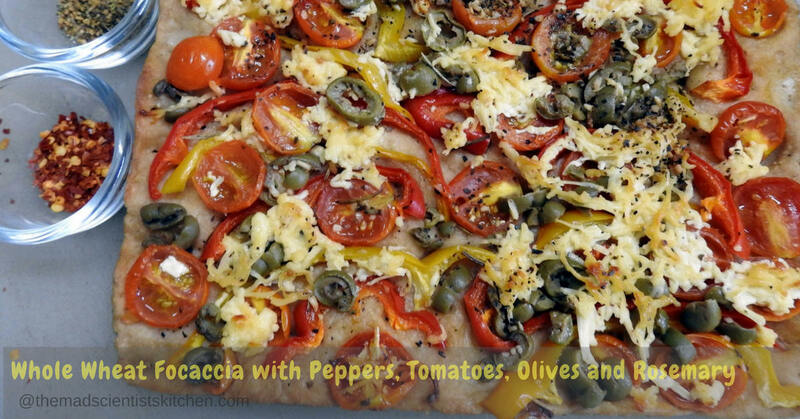 Cant resist to those prefectly baked focaccia and my all time Italian bread is focaccia. How tempting those toppings looks. Vidya so tempts me with her bakes and you have done such a wonderful job with her Focaccia. It is so colourful and appealing! I agree Vidya sure knows how to tempt people. Loved this Focaccia bread with colourful topping. Using whole wheat flour is a healthy option. Great share. A lovely colorful focaccia. I’d love to have some with a salad. 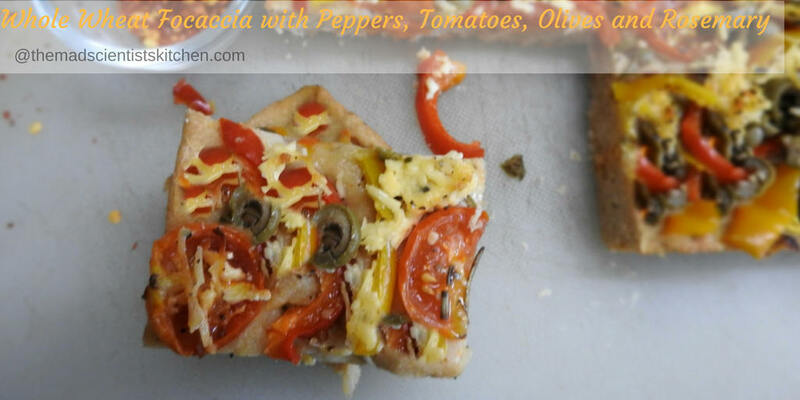 Awesome recipe Archana!You and Vidya created magic with this Focaccia recipe! One of my favorite bread to bake. You have done justice to the recipe. And picture is so inviting. Lovely!